New Size 1.35 oz (40ml) Adhesi-Med Bottle, Mini Combo. 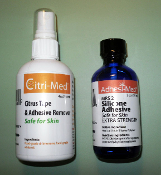 People with sensitive skin may find Adhesi-Med irritating if adhesive comes in contact with glans/musosal tissue. We recommend that those people not apply adhesive directly to the glans. Instead, apply adhesive to device or shaft skin, allow to dry, then attach, or roll skin over glans if retaining. Once adhesive fully dries it is pure silicone and should not cause irritation. First time users should test a small area first to ensure compatibility on glans/musosal skin. Adhesi-med should not cause irritation on external skin. Hundreds of applications per 1.35 ounce (40ml) bottle, it costs only pennies per day to use.